Wage slavery is the accepted cultural expectation in America. But this has not always been the case. In the first few minutes of This Interview of Noam Chomsky he explains how the industrial revolution in 19th century America drove the farming class into wage slavery. What I found most interesting was Chomsky's assertion that the people of that time understood industrialism to be an attack on their freedom and their rich cultural lifestyle. Noam Chomsky is a remarkably intelligent man. And he is an anarchist. I'm not an anarchist, and I don't think that Noam Chomsky is always right. You can be remarkably intelligent and wrong in your conclusions. 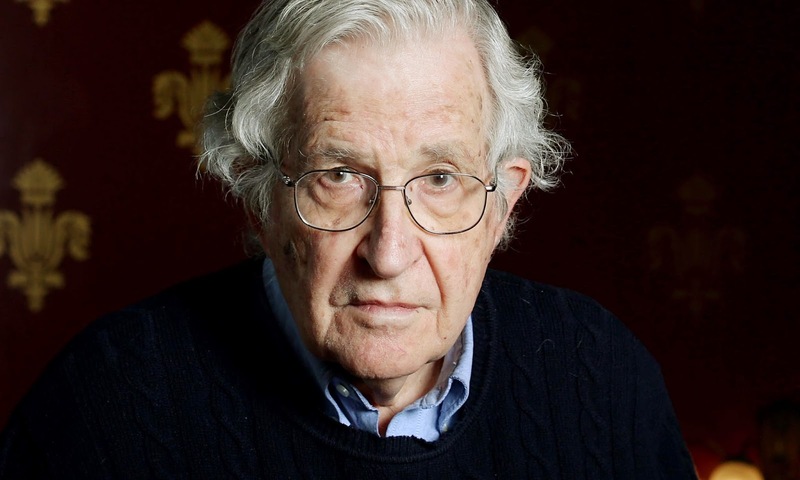 Nevertheless, Chomsky is a brave voice in the midst of an imperialist nation that is now quickly slipping into a condition of ever-greater domestic tyranny. The man interviewing Noam Chomsky at the above link is Chris Hedges. He is another very intelligent man and, near as I can tell, he is a Socialist. I am not a Socialist. But I find Chris Hedges to be another brave voice, and I have listened to many of his online talks at YouTube over the years. Though I disagree with Hedges in some ways, I greatly respect his perspective and his opinion. If you have never heard Chris Hedges, check out This excellent YouTube interview with Alex Jones from a few years ago. I was surprised that he was on the Alex Jones show. 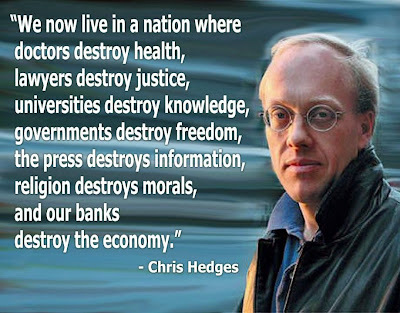 Just do a YouTube search from there for more of Chris Hedges. What intrigues me about Socialists and Anarchists, like Hedges and Chomsky, is that they do not buy into the obfuscation perpetrated by the Republican-Democrat political paradigm. They don't follow in lock step, thinking and acting as the media manipulators so skillfully direct the masses to think and act. They are equally critical of both political parties, and the statist agenda. They understand and chastise the corporate-capitalist takeover of American government. In other words, they see many of the true problems with America more clearly than most. Thanks for posting these types of posts. It is good to know I'm not alone in my thoughts about how enslaving our current worldly system is. This post is a good example of why I value your blog. Strictly based on labels and stereotypes, one would not expect a Christian Agrarian to search out and listen to a Noam Chomsky interview, much less judge his ideas on their merits instead of the label that has been assigned to him. While I will continue to visit for practical homesteading sharing, it's a bonus to get the occasional dive in to philosophical underpinnings. great thoughts. i believe it all comes back to debt. we ALL trade time for $, especially when self-employed. the big difference, do you OWN your land and capital equip. secondly, do you have a VALUABLE education. not just college, but any edu that sets you apart as valuable. college paid off for me. no debt, and i make 5x what my peers do without the education. plus, i work from home 3 days and can cut wood, work the garden, etc at breaks. from Scott Nearing's video, his 1 hour of cutting brush could be done in 2 minutes with a chainsaw. not that he has to, but if he wants to he has the option. a good education = a chainsaw as invaluable in the time they will save. cut 4 cords by hand in 4 weeks, or cut 4 cords in 4 days. your "slavery" is significantly diminished. based on these 'wage slave' postings, do you feel your self-employment makes you more 'free' or less? my wife and i debate getting a milk cow for the same reason. great benefits, but we become 'chained' to the cow with time, resources, etc. as always, thanks for the insights and food for thought! It is something of a paradox (and a tragedy) that mainline, evangelical, "conservative," Christians in America do not care to recognize and address the manifold evils perpetuated on so many people inside and outside this country by the American military-political-industrial complex. There are numerous ideas and beliefs from people like Chomsky and Hedges that I disagree with but the fact is that these guys (who certainly do not identify as evangelicals) are exposing and confronting the evil realities of statist and imperial power. They are, in my opinion, doing exactly what the Christian church should be doing. Yes, I am more free as a self-employed, debt-free agrarian. I am now working at home, close to my family and my land, doing work that is creative and productive and satisfying. I awake "naturally," (as opposed to awaking at a prescribed time to be at a workplace), I do not wear a watch, or watch a clock, I do not have an overseer telling me what to do and when to do it. I do not have to strive to please my employer. I do not have to deal with lazy, dysfunctional co-worker personalities. I can not be laid off or fired. I still work hard and, in fact, work harder and longer than if I were a wage slave. But I am not looking for freedom from hard work. Nor am I looking for freedom from responsibility. I suppose it boils down to personal definition. Scott Nearing surely could have bought a chainsaw, but hard manual work was something he embraced and enjoyed. I don't think he would have considered a chainsaw to be a liberating device. I just thought of another benefit of being freed from wage slavery... I can write politically incorrect things on this blog without fear of losing my job. Not that I ever did fear losing my job, but this is an issue with a lot of people who are employed.